This weekend, with my sisters out and about in New York, me and my brother had complete control over the TV, so we had that going for us. Me and Marlon basically spent our entire Saturday afternoon on the couch. 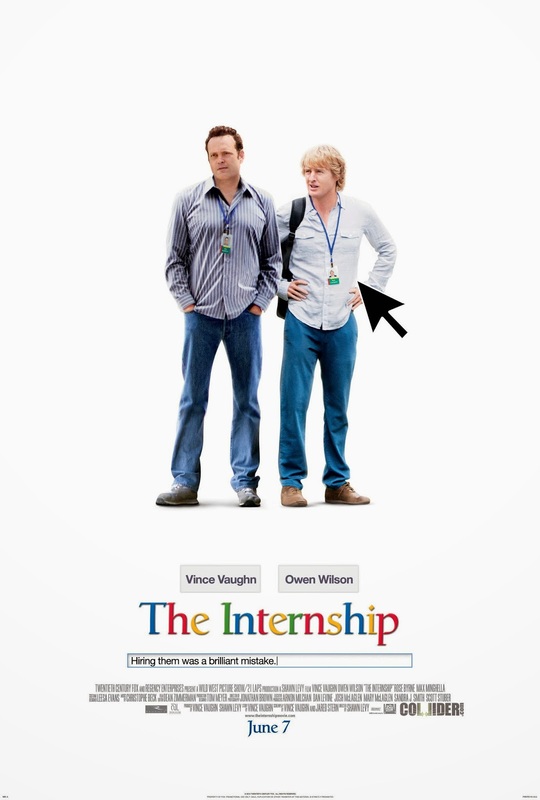 We both had not yet watched The Internship by Date Night director Shawn Levy, so we decided to give it a go. Lovable blabbermouth Vince Vaughn is good in everything, him and Owen Wilson worked particularly well together in Wedding Crashers, and I was very curious in what degree search giant Google would be involved. Billy (Vaughn) and Nick (Wilson) are discarded salesmen who are desperately seeking new jobs. Upon discovering that Google is widely considered 'the best company to work for', the tech-unsavvy duo applies for a summer internship in the hope of landing steady empoyment. The catch? All the interns are sorted into teams and compete against each other in a vicious series of tasks, and only the winning team get jobs. Let the mental Hunger Games begin! The Internship is not quite as funny as Wedding Crashers, and some scenes are just too weird, even for a comedy, but overall, there were enough funny moments and quotes to keep you entertained. There's also another pungent Will Ferrell appearance, so there's that. The competition narrative and superfluous love story didn't really do much for me, especially spun out over 119 minutes, but I did like how they touched upon the post-crisis job market and how it affects college students and recent graduates. So, how did Google fit into all this? 'All of it,' as SNL's Stefon would say. The Internship is not so much product placement within a movie as it is movie placement within a product. It is basically a two-hour Google commercial, with cameos by co-founder Sergey Brin, the Googleplex, and several Google products, including, but not limited to, Google Search, Google+, Google Hangouts, and GMail. How much cash Google had to cough up? Not a penny. The search giant provided some extras and simply charged no location fee to Regency, and in turn they basically received the marketing opportunity of a lifetime. A smart move by Google, although a better movie might have worked better, but I hope this doesn't become a habbit in Hollywood.